After a brutal beating at the hands of a group of thugs, a man wakes up to discover that the people around him no longer have eyes. I did not really come at this looking for a delinquent style "hilarious" manga, since I do not really care about that. 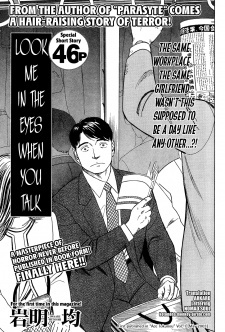 What I wanted was some more Parasyte, and Iwaaki definitely delivers! For me, the humor derived from his works starts and ends with the art, and this was some of the funniest. Nomura's straight, excessively wide mouthed :| face at the beginning to display his indifference is really humorous and carries the first several pages. When Nomura wakes up to an eyeless world on page 11, the humor jumps into overdrive, keyed around the middle panel on the page where the eyeless doctor dismisses the problem with a simple "That's astounding!" and overly happy grin. Now, there are some weak points to the story. An example would be the indifference Nomura shows to a gang beating, and his sudden surprise and clichéd responses to the situation. There is also too much of an exaggerative cynicism with no one wanting to stop little kids from getting too rough with each other. I felt the character of Nomura's girlfriend, Fuyumi, was a bit too simplistic and detracted from the story. In the end, these flaws should not really matter much for enjoyment purposes with this being a 44 page one shot, but it is the reason for my 8/10 rating. If you enjoyed other works by Iwaaki, then read this!